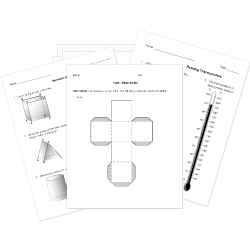 You can create printable tests and worksheets from these Grade 9 Area questions! Select one or more questions using the checkboxes above each question. Then click the add selected questions to a test button before moving to another page. If the height of this triangle is 4 cm, side AB = 5 cm and side BC = 12 cm, what is the area of this triangle (rounded to the nearest whole number)? The formula for the area of a triangle is [math]A = 1/2 bh[/math]. Solve the formula for [math]h[/math]. A triangle has a base of [math]7 \ "cm"[/math] and an area of [math]28 \ "cm"^2[/math]. What is its height? A shopper got a bargain on 361 brick patio tiles, each 1-foot square. What is the side length of a square patio made with the tiles? Calculate the area (a) of a rectangle if you know the lengths of its sides. What is the formula for the area of an ellipse with semi-major axis of length A and semi-minor axis of length B?